Loren Baker is the Founder of Search Engine Journal and VP of Business Development & Co-founder at Foundation Digital, a digital marketing strategy & development agency. At Foundation, Loren works with companies such as ESPN, Copyblogger Media, AirBNB, SONY Pictures and American Eagle Outfitters to steer digital strategies, content production and development. In 2003, Loren created Search Engine Journal, and subsequently established it as a leader in Internet marketing publications. SEJ is now the second most read search marketing publication online, employs a team of 10+ staff and has launched a global conference series, SEJ Summit. Loren has been featured on CNN, NPR, BusinessWeek, ZDNet, PRWeek, TechCrunch, Mashable and AdAge, and is a regular speaker at SMX, Pubcon and other conference series. 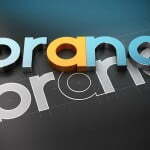 SEO is not about one set of rankings anymore. Identifying success metrics when Google is serving different results based on query themes, user location, personalization, devices and types of content available (video, informational, transactional & internal) proves a challenge. 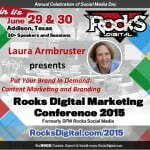 Loren will review how Google is serving different types of results, how to track them and share proven methods to produce results that support your overall search, social, and local branding goals. 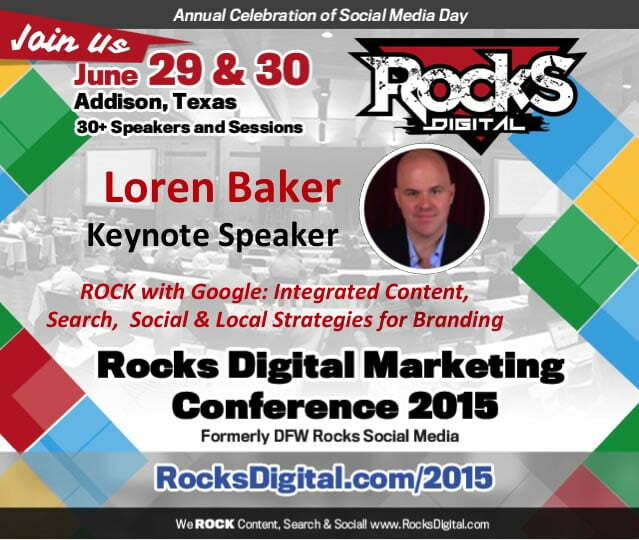 Keynote @LorenBaker to present on #Google at #RocksDigital 2015. Join us.